NMIMS Distance Learning MBA Review: Narsee Monjee Institute of Management Studies is a well recognized name in the field of management education. Since 1981, NMIMS is offering quality education in the field of management education. Now the institute has grown into a deemed university with over 5000 students and more than 430 faculty members. In the year of establishment, the institute was started offering masters degree program in management studies with just 40 students and 4 full time faculty members. As of today the university has become one of the fastest growing university in India with over 5000 students. In this article we'll review NMIMS Distance Learning MBA program. NMIMS offers a 2 years Post Graduate Diploma program (MBA) through NMIMS Global Access School for Continuing Education (NGA -SCE). NMIMS NGA -SCE is one of the 9 schools of NMIMS University offering Post Graduate Diploma Programs, Diploma Programs and Certificate Programs in distance learning mode. Q. 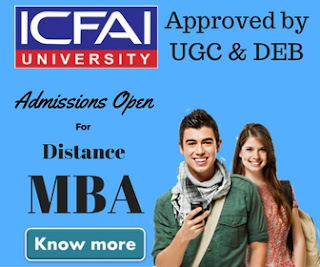 What is the duration of NMIMS Distance Learning MBA? A. The duration of post graduate diploma program is 2 years. Q. Are the programs offered by NMIMS is approved by some authority? A. Yes, The programs offered by NMIMS are approved by Joint Committee of UGC-AICTE- DEC.
Q. 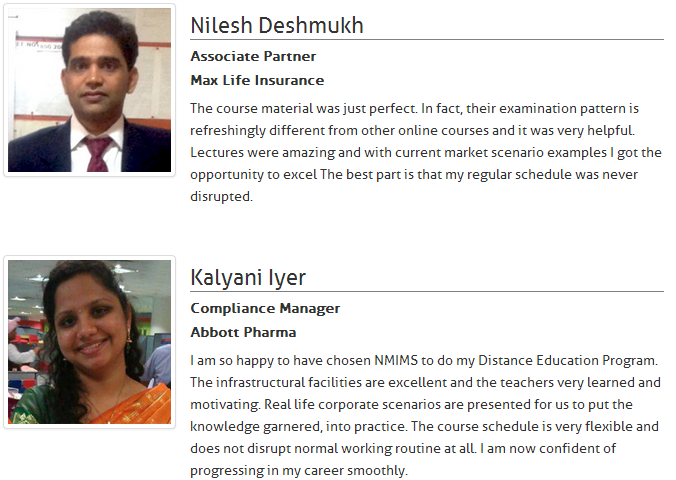 What specializations are available with NMIMS distance learning MBA? Q. 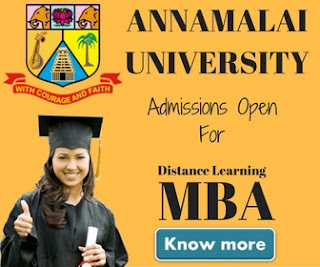 Does NMIMS offers MBA with DUAL specialization? A. No, NMIMS doesn't offer dual specialization. Q. Can Someone change the specialization? A. NMIMS allows to change the specialization only once after admission. Q.What is the minimum & maximum duration to clear the program? A. The minumum duration to clear the course is 2 years and maximum is 4 years. Q.Is there any entrance test to take admission into NMIMS 2 years PG Diploma course? A. No there is no admission test is required to take admission. Q.How the program is delivered by NMIMS? A. NMIMS follows a blended model to deliver this program. It involves conducting live online sessions, Personal Contact Program, lecture presentations, providing learning resources like books and recordings of online sessions. Q.What is the duration & timings of online session? A. NMIMS conducts 8 hours of online session during weekday. The recorded videos are also made available on its online education portal called blackboard. Students can take these lectures from their office or home. Q.Where can someone attend Personal Contact Programs? A. Personal Contact Programs also known as PCP are face to face sessions that NMIMS conducts at NMIMS learning centers. Personal Contact Programs are conducted for 2 hours per course at 7 learning centers located in Mumbai, Delhi, Kolkata, Hyderabad, Bangalore, Ahmedabad and Pune. Q. When are the examination held? A. Examinations are conducted twice a year i.e in the month of June and December. NMIMS has been ranked among the top 10 institutions in India offer distance education MBA courses by ZEE Business consecutively for 2 years. DNA-Indus Learning Survey 2012 ranked NMIMS Distance Learning MBA as 5th best in India. Competition Success Review honored NMIMS Global Access–School for Continuing Education as “Top Distance Learning Institute of India” award consecutively for 2 years at the CSR Awards for Excellence 2013 and 2014. NMIMS is among the top institutions in India offers regular MBA courses although it is not much popular for distance learning program compared to IGNOU, Symbiosis, IMT, ICFAI & SMU. But we would like to say the quality of education is very good. You get a chance to interact India's top most faculty to clear your doubts during PCP sessions. Online sessions give a classroom like environment from the ease of your home & Blackboard, the online study portal makes videos & digital library available to you. If you want to associate a brand name in your education profile, we would strongly recommend NMIMS to you.